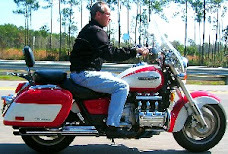 While riding, I am able to mentally compose blog entries with such descriptive richness that a reader can experience the sights, sounds, tactility, smells, and even tastes of a motorcycle ride. Unfortunately, dismounting initiates a mental degaussing process that erases the elegant prose that moments before flowed like water. Some call this Adult ADD. What follows in this post and a few subsequent posts will be a chronological description of my experiences and observances while on the 1K-mile trek. They will include comments about the weather, road conditions, other riders, and spurious thoughts that transpired throughout the 18-½ hours I was on the road. I hope you find these entertaining. Having not gotten to sleep until after midnight--I kept wondering what I had forgotten to pack--I got up a 4am and peered outside. The sky was overcast with a hint of rain in the air. I decided a hearty breakfast was warranted and cooked eggs over hard with toast and juice. Conscious of gastric function, I carefully monitored the quantity of ingested food attempting to strike a balance between sufficiency and that which would require frequent stops. My goal was to synchronize nature calls with fuel stops. The temperature was warm enough that I thought it prudent to open the zippered air flaps in my riding suit before heading off--they stayed open for all but the last 100 or so miles of the ride. I made some last minute adjustments to my packing by removing about half of the tools I squirreled away. I also decided to run back in and make some peanut butter sandwiches that I had previously decided not to take. I rolled out of the garage headed for the stop/start point in Chantilly at about 4:35am. It was dark. And as always when I happen to be out and about at such an early hour, I was surprised at the number of vehicles on the road--the Washington metro area never sleeps. I arrived at the start/stop point just at 5am. Riders, probably at least a ¼ of the total, were already staged and anxious to get going. As I found a spot in line, one of my good motorcycle riding friends walked up and met me. Having no need to seek the hidden zen of 1000-miles in 24 hours, he was not riding but only there to see me off. A good friend indeed. At about 5:15 the first set of "special riders" were sent off. The IBA crew then combed through the staged riders collecting rider identification sheets, making note of rider IDs, license numbers, and odometer readings. I was off at 5:35 just 14-min before the sun was due to rise. Despite the overcast morning, there was soon enough light for motorists stopped by Fairfax police to count the 423 riders snaking their way towards I-66 heading east for the Capitol Beltway and then south towards Richmond. I love the smell of motorcycle exhaust in the morning! Did it. Rain and all I got back at midnight--5 hours to spare. Details coming. Snacks, water, tools, and gear. Route laid out on the GPS. Full tank of gas. I can't think of anything else to do...except get some sleep. In about 7 hours, I'll be staged out and on my way. Good luck to all the riders. Despite the threat of rain yesterday, I rode the Valkyrie to work to see if any issues, primarily with the brakes, would arise. Granted, a 20-mile round trip isn't exactly a test ride, but it poured rain on the return leg so I got a chance to see things work in the wet. Great! Stops right now. It's easy to forget how much different a new set of pads can make. I've scuffed off the preservative that makes new motorcycle tires slick requiring extra caution. The rear tire is essentially new (~1K miles on it). Confidence level on wet roads just went up several notches. Wow! Backfire almost gone. I should have done this a long time ago. There's nothing like the sound of a slowing Valkyrie with 6-into-6 pipes at closed throttle. Since the world has gone to unleaded gas, spark plugs seem to last forever. The old ones looked worn, but not worn out. I've yet to see a worn out plug in over 130K miles. The air filter was dirty, but not overly so. Replacing these two items was more for peace of mind than anything else. Redwing19 sent out the rider's package via email 2 days ago. After reviewing it, I see they've changed the route slightly in the Tidewater area. Instead of heading east around I-64 to the south side via the Hampton Roads Bridge Tunnel, we'll be going due south on I-664 through the Monitor-Merrimac Memorial Bridge Tunnel onwards to Rte 58 W. It's hard to predict traffic in that area early in the beach season, but in general, it's a good move to avoid the Hampton Roads Tunnel. Adjustments are in order for the GPS route. Also, the rider's package makes it clearer that the turn around point is at Black Wolf Harley Davidson in Bristol Va at exit 5. And, there's a requirement to purchase something in Bristol and get a receipt. No problem. Short of packing and sorting, I think I'm ready. I hope the weather is cooperative.